Christian Lopez performing on Mountain Stage in Morgantown, W.Va.
"Steel On The Water" by Christian Lopez live on Mountain Stage. This week's Song of the Week comes from Martinsburg, W.Va's Christian Lopez, recorded in Morgantown with WVU Arts & Entertainment. Lopez was inspired to write "Steel On The Water" after entertaining 5,000 sailors aboard a United States aircraft carrier from Pearl Harbor to San Diego. The song appears on Lopez' 2017 album Red Arrow. "With the sea in his blood and tears in his eyes/ May the ocean rock you to sleep tonight." 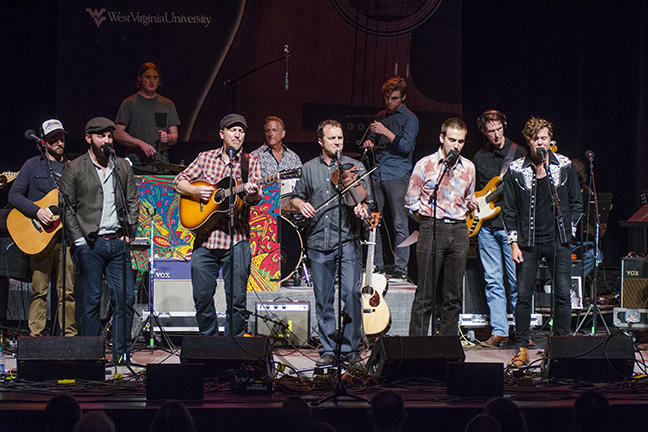 You can hear Lopez' entire set, plus performances from Drew Holcomb & the Neighbors, Andrew Combs, Lost Bayou Ramblers and Peter Mulvey, on this week's episode of Mountain Stage with Larry Groce. Find a station in your area or tune in Saturday evening at 8pm on the statewide radio network of West Virginia Public Broadcasting. Drew Holcomb, Peter Mulvey, Lost Bayou Ramblers, Andrew Combs and Christian Lopez appear on this week's episode of Mountain Stage. Gretchen Peters - "Say Grace" live on Mountain Stage. This week's Song of the Week is by revered Nashville-based songwriter Gretchen Peters.